Output of around 440 kW / 600 hp and Lamborghini?s excellent know-how in the field of lightweight design technologies guarantee breathtaking dynamics. At the same time, the Urus will offer the lowest CO2 figure of all comparable vehicles. As an SUV concept with four generous seats, a versatile luggage compartment, variable ground clearance and, of course, permanent all-wheel drive, the Urus delivers unique driving fun with virtually no limitations. The interior, too, matches the standards of this super athlete with innovative materials featuring carbon fiber technology like the patented Forged Composite®. 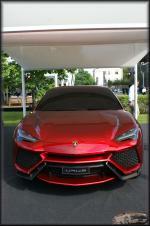 "The Urus is a very concrete idea for the future of Lamborghini ? as a third model line and as the perfect complement to our super sports cars," says Stephan Winkelmann, President and CEO of Automobili Lamborghini. "SUVs stand for freedom and emotion. SUVs make up one of the most successful market segments worldwide. The Urus is the most extreme interpretation of the SUV idea; it is the Lamborghini of the SUVs."